The Place Located in Kennedy Town in Hong Kong, Sun Hing Restaurant is one of my favourite dim sum restaurant during my most recent trip to Hong Kong. Thanks to the opening of Kennedy Town MTR station at the end of 2014, the small dim sum eatery is now located about 5 minutes walk from the station. The first thing which greeted me was the boisterous ambience and incessant conversations, which is a quintessential dim sum experience in Hong Kong. Be warned that there is no proper queue system, so the tip is to head in and look for a seat yourself. The staff might also ask for the number of people in your party, but the rule of thumb is to come in smaller groups, or be prepared to split into different tables. In some aspects, Sun Hing Restaurant reminds me of Tim Ho Wan a decade ago when it was still a nondescript eatery in Mongkok. The Food The dim sum dishes are prepared freshly in the small kitchen space at the back of the restaurant. It might be different to order if you do not speak Cantonese or Mandarin, last resort is to peep at the tray of dishes being carried out by the staff and point to the ones you desire. Alternatively, some of the dim sum baskets are laid out at the front of the stall, where you could head towards to pick yourself. Bring along the small slip of order form given to your table once you are seated. I managed to try a good variety of dishes, though the highly rated Har Gow (Shrimp Dumpling) wasn’t available. The absolute must try for me is the Custard Bun, filled with a rich flavour of salted egg custard. The texture of the bun is soft, while the custard egg flavour is simply divine. I am not a big fan of custard bun usually, especially those which are overly sweet, and I am surprised I am so fond of this version. You couldn’t go very wrong with the Siew Mai (Pork and shrimp dumpling) as well, which has a good proportion of the ingredients and a tasty flavour. For something slightly different, try the Beancurd Skin wrapped with Minced Pork! 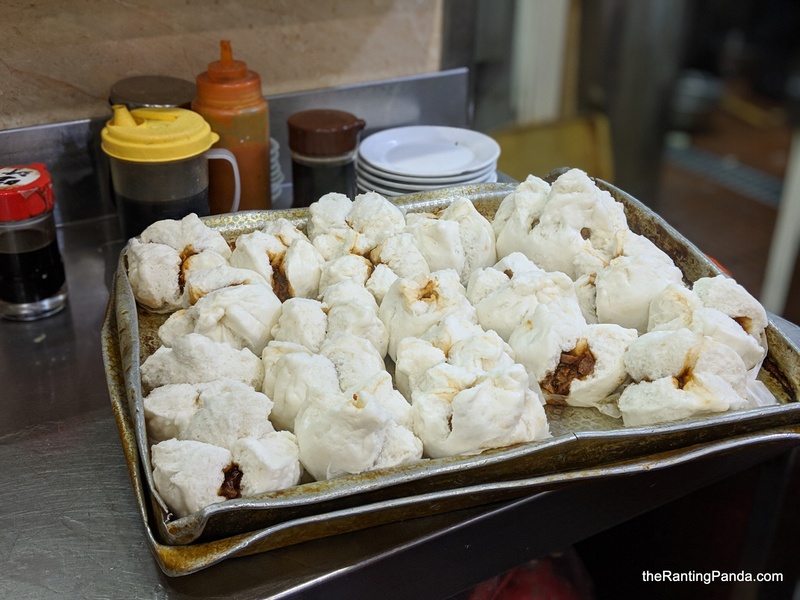 The minced pork is quite good, while the thinly wrapped and delicious beancurd skin makes it very easy to bite into it. I am very fussy about my Chee Cheong Fun, and I highly recommend trying the version at Sun Hing. The rice roll here is wrapped with char siew, which is freshly made and easily one of the most memorable ones I have had. Needless to say, the char siew plays a big part here. The last dish I had was the Char Siew Bun, a pretty decent version with my much surprise. You could skip this if you fancy something else. Rants It might be a challenge to get a table. Be prepared to wait for one, and also a considerable waiting time for food. Will I Return Again? I left Sun Hing feeling very impressed by the food quality. I spent HKD108 for five dishes, which works out to be about HKD21 on average for each dish, a very good value. This will be the reason for me to head back to Kennedy Town again.